Rudradhari caves and falls are located in Kasauni- Almore road with 12 km distance from Kasauni. 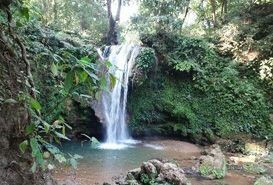 People who are adventurous and willing to experience thrill and seclusion of being in a forest should definitely visit these caves and falls. There is also a small ‘Someshwar’ temple situated near by falls, devotees have strong faith and spiritual connection with this temple. The lush green paddy field with water falling vertically, presents some fascinating view which will leave you speechless. Certain other caves have been explored near waterfalls which shouldn’t be missed either. For trekkers and people interested in mild adventure should definitely give it a try because as people say ‘your Kasauni trip isn’t complete without visiting Rudradhari caves falls.